For more than 15 years, K2 Design and Fabrication has been a trusted partner of James Hardie. As the world leader in fiber cement siding and backerboard, James Hardie participates in over 200 shows and events annually. There are times when James Hardie will have fifteen events in a given weekend, explains David King, CEO of K2 Design and Fabrication. In-depth knowledge of the client properties and marketing strategy is key to optimizing the program. The partnership began in the early days of K2 and has grown and developed as both the organizations’ have grown. Both K2 and Laurie Gizer, Associate Marketing Manager for James Hardie, agree a long-term strategic partnership provides exceptional value. Familiarity with the program, allows all team members to stay ahead of the game. At James Hardie, innovation is vital to maintaining their pre-eminent position in the fiber-cement industry. Jay Tinen, Marketing Manager, provides on-going direction to showcase the continuous stream of new products. The interaction between product design and exhibit fabrication at K2 remains a key element to showcasing these products in new and innovative ways. K2 Design and Fabrication maintains a project team that is closely familiar with the client products, their market development strategy and show program schedule. A continuous feedback cycle means that the team at K2 is already working on improvements for the upcoming season as the current show circuit winds down. In the spring all the custom booths and modular properties will come back “home” to K2 headquarters in Corona, CA for the team to refurbish and upgrade. Some of the booths on the shows circuit for James Hardie have been in use for years—a true testament to the K2 commitment to quality. Identifying key issues through open and consistent communication enables the program to grow and flourish. K2 is currently implementing an online ordering system for James Hardie regional events. 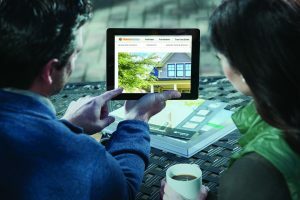 This will empower the James Hardie Representatives across the country to order complete display solutions throughout the year. For Gizer, this streamlining enables her to work more strategically in managing the multiple responsibilities she has at James Hardie. Additionally, the online ordering system provides more effective use of resources resulting in optimized program management.